Power of My Cenacles.” It is our hope that Our Lady’s words will impress upon all of you the urgency of gathering in cenacle with Mary. The Blessed Mother is calling all of us to prayer in cenacle with her, where we will receive the precious gift of the Holy Spirit. They are truly a powerful weapon in Our Lady’s hands as we enter more deeply into the time of great trials, of confusion and of apostasy. THE MESSAGE OF FATIMA IS BEING FULFILLED! “Its fulfillment is necessary for you, my children, … so that you may attain salvation. “Its fulfillment is necessary for the Church, … so that from its painful and bloody trial it might emerge all beautiful, without spot or wrinkle, in imitation of its heavenly Mother. 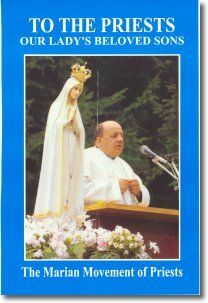 The book, “To the Priests, Our Lady’s Beloved Sons,” which contains all the messages which Fr. 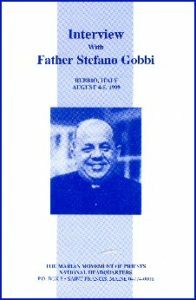 Gobbi received from Our Blessed Mother between 1973 and 1997. The booklet, “The Spiritual Power of My Cenacles”, which contains this text in book form. 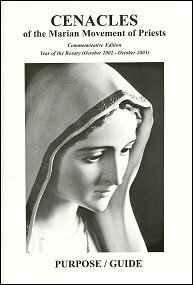 The booklet, “Cenacles of the Marian Movement of Priests – Purpose/Guide”, which serves as a handbook for use in the cenacles. The video and transcript of the interview with Fr. Gobbi given in Rubbio, Italy on August 4, 1999. Leading others to entrustment to Our Lady and to the formation of cenacles of prayer. “It is the message of Fatima which is reaching its fulfillment and is being realized everywhere, through the merciful action of your heavenly Mother. Through it I have asked for the consecration to my Immaculate Heart, as a sure means of obtaining conversion of heart and of life, and of leading humanity back along the road of its return to the Lord. The third commitment – to reach out to her other children, to bring them to consecrate themselves to her and to form cenacles of prayer with her. “With these cenacles, you are able to obtain the grace of conversion for many poor sinners, especially for those most in need of divine mercy. “With these cenacles, you offer a great force of intercession and of reparation to your heavenly Mother, who has intervened many times, in an extraordinary way, to shorten the painful time of the great purifying trial. “You are the sign of my presence in the times of the painful trial which is preparing the triumph of my Immaculate Heart in the world. Indeed, through the Marian Movement of Priests, I am calling all my children to consecrate themselves to my Heart, and to spread everywhere cenacles of prayer: among priests, the faithful, children, youth, and in families. Throughout her messages to Fr. Gobbi, Our Lady repeatedly asks for the formation of cenacles: “Multiply your cenacles of prayer.” Why are they so important to her? Why are they so dear to her Heart? The answer is simple. It is because of their many spiritual benefits, and also because they are the golden key that unlocks her tremendous power of intercession. The cenacle is a powerful tool in Our Lady’s hands to lead many to salvation. In the cenacle, we allow her to prepare us spiritually for Our Lord’s second coming. The cenacles bring us security, peace, consolation and hope. They are our protection against confusion and apostasy. They are a protection from the evils which are threatening the families of today. The cenacles act as “lightning rods” which will protect us from the chastisement. The cenacles will be our safe havens in the hour of the great trial. Children’s cenacles, in particular, give great spiritual power to Our Lady. The cenacles are the spiritual force which, in the end, will release in Our Lady the power given her by Jesus to crush the head of Satan! In the cenacles, the Holy Spirit will come down to lead us to the second Pentecost. 1.The cenacle is a powerful tool in Our Lady’s hands to lead many to salvation. “Multiply your cenacles of prayer. “Multiply your rosaries, recited well and in union with me. Offer me also your suffering and your penance. “I ask for your prayer and penance for the conversion of sinners, that even my most rebellious and most distant children may return to God, who awaits them with the merciful eagerness of a Father. Our Lady calls us to share in her co-redemptive mission of assisting her in bringing to salvation all of our brothers and sisters! This is divine love! “There is no greater love than to lay down one’s life for one’s friends.” (Jn 15:13) This is the kind of love Jesus requires from his apostles and disciples. Therefore, do not abandon your cenacles; rather, multiply them by the hundreds and by the thousands – in your churches, in your homes, in schools, everywhere! 2.In the cenacle, we allow her to prepare us spiritually for our Lord’s second coming. The time is fast approaching when each of us will have to give an account of our lives. Will we find ourselves ready when Jesus comes? Will we be spiritually prepared? Now is the time to arise from our slumber and be watchful and ready. The illumination of consciences (judgment in miniature) will not be easy for any of us – every minute detail of our souls and consciences will be scrutinized by God’s light, and nothing will go unnoticed. Our Blessed Mother, knowing the great pain that this will cause us, her children, has come to prepare us. By exhorting us to live our consecration – following the commandments; receiving the sacraments, especially that of confession; living chaste and moral lives; being charitable to our neighbor, etc. – she is trying to cleanse each of us and to make us realize what it is that we need to rectify in our lives. If indeed his return is close at hand, then my motherly action becomes more concerned and vigorous, in order to assist all my children to remain ever in the truth of the faith. This is why I have asked you to consecrate yourselves to my Immaculate Heart. This is why, in these times of yours, I have spread everywhere my Marian Movement of Priests: to form the little flock, reunited in the prayer of the cenacles and watchful in expectation – the flock gathered together and formed by me to ever preserve the true faith. 3.The cenacles bring us security, peace, consolation and hope. “Now, as the battle grows more violent, I must provide moments of spiritual peace and repose for all. In these cenacles you will enter into my repose because, by praying and making reparation with your heavenly Mother, you will be consoled and strengthened by me. Our Lady will not allow her chosen ones who have remained faithful to her to be seduced by the charms of him who will set himself against Christ – yet another important reason not to abandon our cenacles! We will be guarded in the depths of her Immaculate Heart and she will give us the vision to see which path to follow. “The times of the general confusion and of the greatest agitation of spirits has come. Confusion has entered into the souls and the lives of many of my children. This great apostasy is spreading more and more, even through the interior of the Catholic Church. Errors are being taught and spread about, while the fundamental truths of the faith, which the authentic Magisterium of the Church has always taught and energetically defended against any heretical deviation whatsoever, are being denied with impunity. The episcopates are maintaining a strange silence and are no longer reacting. When my Pope speaks with courage and reaffirms with force the truths of the Catholic faith, he is no longer listened to and is even publicly criticized and derided. There is a subtle and diabolical tactic, woven in secrecy by Masonry, which is used today against the Holy Father in order to bring ridicule upon his person and his work and to neutralize his Magisterium. Victims of the great apostasy are those children of mine who, often unknowingly, allow themselves to be carried along by this wave of errors and of evil. Victims of the great apostasy are many bishops, priests, religious and faithful. In these times, in the Catholic Church, there will remain a little remnant who will be faithful to Christ, to the Gospel, and to its entire truth. The little remnant will form a little flock, all guarded in the depths of my Immaculate Heart. This little flock will be made up of those bishops, priests, religious and faithful who will remain strongly united to the Pope, all gathered together in the cenacle of my Immaculate Heart, in an act of unceasing prayer, of continual immolation, of total offering to prepare the painful way for the second and glorious coming of my Son Jesus. 5.They are a protection from the evils which are threatening the families of today. Our Lady, “the Mother of Life and the Queen of the Family” (cf. 560l), stresses the great need for families to gather together in cenacles of prayer to save them from the evils which are threatening the life of the Christian families. They are the instrument by which Our Lady can set aside, delay and mitigate the chastisement. As of now, the cenacles have given her the power to compel the mercy of God to intervene to shorten the period of trials. “…I have urged all my children, who have listened to me and followed me, to gather together in cenacles of prayer and penance, in order to obtain from Jesus the great gift of his divine mercy. 7. The cenacles will be our safe havens in the hour of the great trial. “You have now entered into the times of the second Pentecost. For this reason, it is necessary that these cenacles be multiplied in every part of the world. I ask that all the Church be gathered together in the spiritual cenacle of my Immaculate Heart. Then the Holy Spirit will bring you to the understanding of the whole and entire truth. In the cenacles, we will also be given the gift of contemplation and prayer to penetrate into the mystery of the Gospel – to seek, welcome, love and live it! “Let yours be an interior silence, which leads you to listen, with love and faith, to the word of God alone. Penetrate into the deep mystery of truth and beauty, which is revealed to you in the Gospel. Let the Gospel of Jesus be the only word of life which you seek, welcome, love and live. Let yours be that interior silence which leads you to contemplation and prayer. Let your prayer become more intense. Let it be a true prayer of the heart, which you make with me and by means of me. Just as for the Apostles, the Cenacle of Jerusalem preceded the fullness of their mission, so also will it be for us. In the cenacles, Our Lady prepares us spiritually to be the “apostles of these last times,” to go out and evangelize and bring souls back to Jesus. By our preparation in the cenacle, we will be given the spiritual gift of being able to help those around us who will be in great need of our assistance during the great tribulation. Our Lady prepares us for the time when we will have to share in Jesus’ role as divine physician, to minister to the needs of those who will be in need of our guidance, love and support during the times of confusion and apostasy. “Give me your prayer, your suffering and your trust. Do not be afraid if my Adversary attacks you with terrible snares, to lead you to discouragement. 10. Children’s cenacles, in particular, give great spiritual power to Our Lady. Our Lady especially needs the “crusade of innocent prayer of the little ones,” which gives her an ever greater power of intercession and reparation. 11. The cenacles are the spiritual force which, in the end, will release in Our Lady the power given her by Jesus to crush the head of Satan! “You understand now, my beloved children, why, in these last times of the battle between me, the Woman Clothed with the Sun, and the great Dragon, I am asking you to multiply everywhere the cenacles of prayer, with the recitation of the holy rosary, meditation on my word, and your consecration to my Immaculate Heart. “With these, you make it possible for your heavenly Mother to take action in binding Satan, so that I may thus carry out my mission of crushing his head, that is to say, of defeating him once and for all, shutting him up in his abyss of fire and sulfur. “The humble and fragile cord of the holy rosary forms the strong chain with which I will take as my prisoner the dark ruler of the world, the enemy of God and of his faithful servants. Thus the pride of Satan will once again be defeated by the power of the little, the humble and the poor. 12. In the cenacles, the Holy Spirit will come down to lead us to the second Pentecost. expectation of receiving in fullness the Spirit of Love. (cf. 226j) The Immaculate Heart of Mary is the golden doorway through which the divine Spirit passes to reach us. (cf. 226k, 426l) It is the new and spiritual cenacle, into which all the Church must enter in order to obtain the gift of the new Pentecost. (cf. 428c) The Second Pentecost can come to pass only in the spiritual cenacle of her Immaculate Heart (cf. 521d), and only in the cenacle of her Immaculate Heart, when the whole Church will have entered in, will the great prodigy of the second Pentecost take place. (cf. 355b) This will be her great gift! Through her messages to Fr. Gobbi, Our Blessed Mother is trying to reach all of God’s children, urging them to multiply cenacles of prayer and to enter into the spiritual cenacle of her Immaculate Heart. Only then can the second Pentecost come to pass, when the divine Spirit of Love will pour down from heaven a river of grace and of mercy. It will come like a dew upon the world and will transform the desert into a garden. (cf. Mess. 428) It will be a divine fire of purification and of sanctification that will heal the Church and renew the entire face of the earth! Finally, Our Lady promised that, because of the cenacles which have spread in every part of the world, we will see the wonder of the second Pentecost! Let us then continue to multiply our cenacles so that we can hasten this great event for all humanity! SO PLEASE, DO NOT ABANDON YOUR CENACLES!